Martin, Chief Executive Officer and Founder of Cabrera Capital Markets has been responsible for overseeing all firm activities including Investment Banking, Municipal Finance, Corporate Debt, Initial Public Offerings, Trading, and Institutional Sales. Martin serves as the Chief Executive Officer and is the Founder of Cabrera Capital Partners. He holds a Series 66 Uniform Combined State Law Investment Advisor license. Martin is a member of the Investment Committee. He has been active in the financial services industry since 1994. Before forming Cabrera Capital Markets, Martin was a General Principal and Branch Manager for Salomon Grey Financial Corporation. Prior to this position, he was a Senior Vice President at Amerivet Securities, Inc. where he managed their Chicago office for 5 years. Additionally, Martin held positions at CNA Insurance, Olde & Company Inc., and Merrill Lynch International in their London office. Martin holds a Bachelor of Science degree in Finance from Northern Illinois University and holds the following securities licenses: Series 7 General Securities Representative, Series 24 General Securities Principal, Series 4 Registered Options Principal, Series 53 Municipal Securities Principal, Series 55 Equity Trader Limited Representative, and Series 63 Uniform Securities Agent State Law. 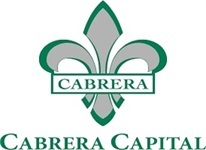 Robert serves as Chief Operating Officer and Chief Financial Officer for Cabrera Capital Markets, LLC with responsibility for all aspects of the daily operations of the company. He oversees business groups consisting of Municipal Finance, Municipal Securities Trading, Taxable Fixed Income, and Equity Trading, as well as the operations support staff. Robert serves as the Chief Operating Officer, Chief Financial Officer and as a founding Principal of Cabrera Capital Partners. He is instrumental in the formation and development of Cabrera Capital Partners and holds a Series 65 Uniform Investment Advisor license. Robert is a member of the Investment Committee. Robert works closely with Martin Cabrera to develop and oversee Cabrera’s businesses. Prior to joining Cabrera, Robert served as an Operations Manager for Schwarz Supply Source, responsible for 12 domestic and international distribution facilities in four countries. He holds a Bachelor of Science degree in Finance from Northern Illinois University. His professional securities licenses include; Series 7 General Securities Representative, Series 24 General Securities Principal, Series 27 Financial and Operations Principal, Series 63 Uniform Securities State Law-Registered Agent, Series 79 Investment Banking Representative, Series 99 Operations Professional, Series 3 Commodities Futures Associated Person, and Series 87 Research Analyst (Part II). Brad Ziemba serves as the Chief Compliance Officer at Cabrera Capital Markets, LLC. He has been involved in compliance, operations, and management for a variety of financial institutions since 1997. Prior to joining Cabrera, Brad participated in the compliance department for Elementum Advisors and D.A. Davidson & Co. He also spent 10 years as the Chief Compliance Officer of Duncan-Williams, Inc. in Memphis, TN, where he managed a wide range of compliance and operational matters while serving on the firm's Executive Committee. Brad earned a BBA in Finance from the University of Memphis and a MBA with honors from the University of Notre Dame Mendoza College of Business. His professional securities licenses include; Series 7 General Securities Representative, Series 9 & 10 General Securities Sales Supervisor, Series 24 General Securities Principal, Series 63 Uniform Securities State Law-Registered Agent, and Series 87 Research Analyst (Part II). Cynthia Au is Cabrera Capital Markets' Human Resources Director. Cynthia has over fifteen years of comprehensive Human Resources management experience which includes employee relations, recruitment, training, compensation and benefits, and legal and regulatory compliance with federal, state and local laws. Cynthia has a well-rounded background as she previously worked in diverse industries including banking and healthcare. Cynthia holds a Bachelor of Science degree in Human Resource Management from Northern Illinois University in DeKalb, Illinois. "My responsibility is getting all my players playing for the name on the front of the Jersey, not on the back". "You don't need a title to be a leader"